For other uses, see Maiko (disambiguation). Misedashi, a day when a girl becomes maiko. Notice two dangling kanzashi on the sides of her hairstyle. A maiko (舞妓) (/ˈmaɪkoʊ/, Japanese: [ma.iko]) is an apprentice geisha in Kyoto and Western Japan. Their jobs consist of performing songs, dances, and playing the shamisen or other traditional Japanese instruments for visitors during ozashiki. 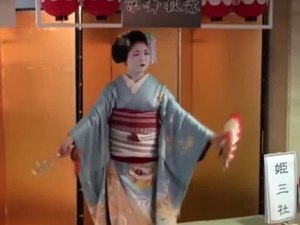 Maiko are usually aged 15 to 20 years old and become geiko after learning how to dance the traditional dances, play the shamisen, and learning Kyō-kotoba (dialect of Kyoto), regardless of their origins. In the morning, maiko take lessons to polish their performances. At night, they go out to work. They dance, sing, play the shamisen, and serve visitors at exclusive ochaya. (割れしのぶ): Wareshinobu is worn by junior maiko for the first 2-3 years. A mage (bun) is made by inserting two red kanoko (padded silk) and is then decorated with a kanokodome in the center of the mage. It's worn for misedashi (formal debut) where they will wear formal kanzashi made out of tortoise shell, silver and red miokuri and two bira bira. (おふく): Ofuku is the default hairstyle for senior maiko. It looks similar to wareshinobu, but the mage has a slightly different shape, and instead of stuffing the kanoko inside the mage (bun), they will wear a tegara (triangle of silk) pinned to the outside. The color of the tegara changes as the maiko gets older. Right after switching hairstyles it will be red, then pink and finally different colors. (奴島田): Yakko Shimada is worn by senior maiko for Shigyoshiki (the start of another year), Hassaku (summer Thanksgiving in Gion Kobu only), and when performing the tea ceremony at odori. The hairstyle is trademarked by a string of beads placed over the mage, which is punctuated by a single colored kanzashi, known as hatsuyori. For winter the hatsuyori will be mainly coral with one jade bead, and for summer it will be mainly jade with one coral bead. The hairstyle also has a long kanoko tied under the mage that can be many colors, although red is most common. (勝山): Katsuyama is worn by every senior maiko during Gion Matsuri. The mage resembles Yakko Shimada in both shape and in that it has a long kanoko that can be red, pink or blue if the maiko is very senior. On either side of the mage are bon-ten (silver flower kanzashi). It is said that the hairstyle was created by the oiran Katsuyama from the Edo period. (先笄): Sakkō is the last hairstyle worn by maiko before becoming full fledged geiko, and is worn for two weeks before the erikae. It is the most elaborate and expensive of all the hairstyles. It's decorated with formal tortoise shell kanzashi, and a special sakkō kanzashi designed by the maiko herself, with auspicious animals like cranes and tortoises. The mage is very complex and has a hanging streak of hair. The night before the erikae the okaa-san (proprietress) and fellow maiko and geiko will cut the streak of hair and the ties holding the hairstyle together. (引きずり): Maiko wear special kimono called hikizuri. They are usually 200 cm long, with a padded hem to create weight so it will trail beautifully on the floor. When outside a maiko will hold her hikizuri up with her hands, or tie it in place so that it does not touch the ground. The sleeves are long like a those of a furisode. The kimono can be any color and the motifs and patterns are seasonal. For formal occasions the maiko will wear a black hikizuri with 5 okiya crests. (だらり帯): The darari obi is a 6-7 meters long obi worn exclusively by maiko. Due to its length and weight an otokoshi-san (male dresser) is needed to tie it. At the end of the darari obi is a crest, so that every one can see which okiya the maiko belongs to. For formal occasions the maiko will wear a gold darari obi. 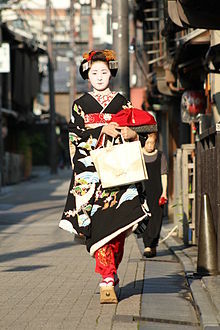 Wikimedia Commons has media related to Maiko.